We’re extremely privileged (living in a first world country), in that we rarely have to worry about terrorist threats on our home soil. While it’s true that the potential for terrorism, suicide bombers and religious extremists is always there, we’re fortunate enough to have a relatively stable government, fair police officers, and armed forces that are unlikely to hold a military coup for power. Others around the world are not so lucky. Pakistan, only a young nation, has been strife with the above problems for most of her life, and the inhabitants of the country have been forced to deal with all of it. As victims of Muslim extremism (in the form of the Taliban), many Pakistanis have faced fear and danger on a daily basis, whereas we only really became aware of the Taliban threat when they claimed responsibility for the American 9/11 attacks. Long before this moment, and even now, the people of Pakistan have struggled to survive in a dangerous and volatile world, where the innocent acts of singing or dancing could have you shot. Despite the constant threats, there are some individuals who have stood up for these people, campaigning for equality and basic human rights. One of them, a young girl named Malala Yousafzai, has become well-known world-wide for several reasons. She, with the constant support of her family, has fought for her right (as a girl) to have an education. She has spoken out for peace on global stages and is the youngest person ever nominated for a Nobel Peace Prize. She is also known as the girl that the Taliban shot in the face. On October 9, 2012, the world was shocked at the news that young Malala had been shot in the head at point-blank range while riding the school bus home. The Taliban considered this fifteen-year-old girl to be a serious threat to their campaign for dominance, and thought to eliminate her from the equation. What they didn’t count on was the love and support that the world had for this strong-willed and determined teenager, and the profound effect her shooting would have on world leaders and the public at large. In this inspirational autobiography, Malala (who miraculously survived the attempt on her life) tells about her efforts to fight for girls’ education in a society where sons are considered more worthy than daughters. She details her childhood in the Swat Valley (a beautiful piece of land that is part of Pakistan but which also holds a special status as a princely state), and the Taliban’s gradual and ultimately horrific integration into the local community. As followers of the Quran, many of Malala’s neighbours, family and friends were originally welcoming to the Taliban, who seemed to hold similar conservative values. But as the Taliban grew in power, they began to enforce strict new rules on the people, and resort to violence to get their message across. Many of the devout Muslims who once followed them began to question just how any of this related to the peaceful ideals of Islam. Before long, DVDs, CDs and similar entertainment were forbidden, women had to have their hair and face covered (and have a male relative with them) if they left the house, schools were being bombed, and the bodies of beheaded policemen were being found on the streets. Throughout this trauma, Malala and her father continued to campaign for educational rights- doing interviews on the radio and in print, and trying to show the rest of the world what was happening in their once peaceful valley. 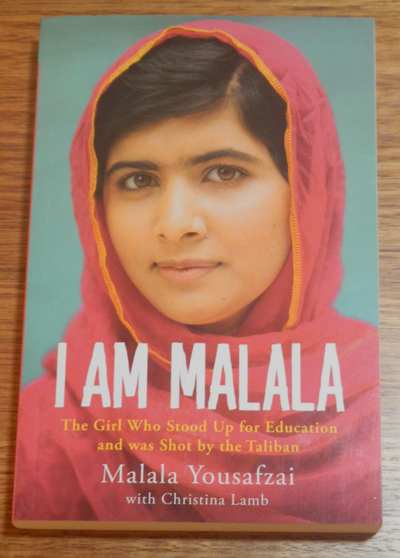 A majority of this book details Malala’s life in the years before (and leading up to) her shooting. This includes a brief history of Pakistan, important events that occurred (including the election, exile, return, and assassination of Benazir Bhutto- the first female Prime Minister in the Islamic world), terrorism (both local and global) and war (between the military, the Taliban, and foreign forces). Only a few sections at the end of the book cover Malala’s attack and subsequent recovery- she is more focussed on getting her message for peace and human rights out there, than seeking pity for the injuries she received. Lucky enough to have a father who is adverse to his cultural upbringing (which favours sons), and who wholly supports her efforts (believing that everyone should have an education), Malala has become a spokesperson for change, and has become an inspiration to many. There are multiple schools and awards named in her honour, and she has a fund set up to help support local communities in their quest for basic education. This book is inspirational and virtuous and you can only benefit from reading this girl’s remarkable story. What an inspiration! I definitely need to read this one.